Savoy 1404 serves her guests the finest in upscale beach living in a private high-rise residence nestled between the calm waters and stunning skies of Venetian & Doctors Bay. Life on Florida’s Paradise Coast has never been more refined, scenic and coastal casual. 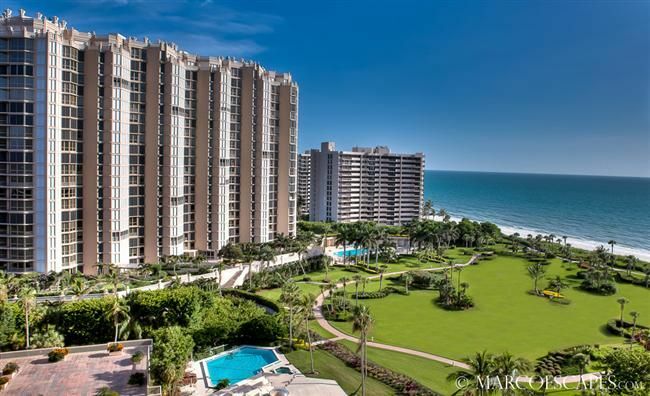 Located 14 stories above the sand, this divine beachfront condo opens to spectacular Gulf and park views that will leave you breathless. With her prime southwest positioning, Savoy 1404 is blessed with sunshine all year long—even in the winter months.Life is better in the clouds, especially when you have access to dual terraces that give way to picture perfect views from day until nightfall. Her open plan living area and fully stocked gourmet kitchen is open, airy and comfortable for both romantic evenings or for entertaining late into the night. Ceramic tile floors, granite countertops, tile backsplash, and classic southern wood shutters put the finishing touch on an already spectacular beachfront condo.All guests are provided full access to Park Shore’s amazing selection of amenities. Work on your swing at two tennis courts, get your heart pumping on the biking and jogging path, and fitness center. Soak up the sun as you grill your favorite meals, enjoy the rooftop patio, or simply spend the day lounging next to the large beachfront heated pool and spa. 24/7 doorman, covered parking, stunning new atrium lobby and 24-hour security make your Naples experience at The Savoy complete!